Human Food Interaction (HFI)  as a field of research is gaining currency within HCI with a focus on how we grow, shop, cook and eat food with the use of digital technology. The advancements in food printing technologies  add an extra dimension to these established practices and research is needed to understand how it would affect people’s practices and relationship with food. For instance, instead of cooking food with hands or using traditional kitchen appliances, food printers allow creation of edible artifacts from digital designs, currently using viscous materials (e.g. cheese, marzipan, dough and chocolate) and powdered substances (e.g. sugar). As such, food printing connects cooking with digital information, wherein digital 3D print models can replace traditional recipes. We are particularly interested in the implication of such technology towards personalized nutrition wherein quantified self (QS) technologies (e.g. Fitbit, heart rate monitors, calorie counters)  can be combined with food printing technologies to provide users with different information and experiences that meet their needs and desires. We find this an intriguing combination that we believe holds an exciting premise for HCI and HFI. We aim to bring together researchers and practitioners from different communities including personal fabrication, design and creative practice, quantified self, food design, health and nutrition, interaction design, physical visualization to: 1) Develop a joint understanding of competing/related issues on printing food, data representation and its effect on multiple domains including health and society. 2) Discuss potential solutions and concepts that contribute to future research directions and requirements. 3) Help shape the research community around food-related technology design. The essential discussion that will emerge at the venue will help in moving forward these research fields individually as well as in unison – which is timely given the growing need for defining health and wellbeing strategies. The discussions will high- light the potential solutions and concepts for future research directions in food based technology design. 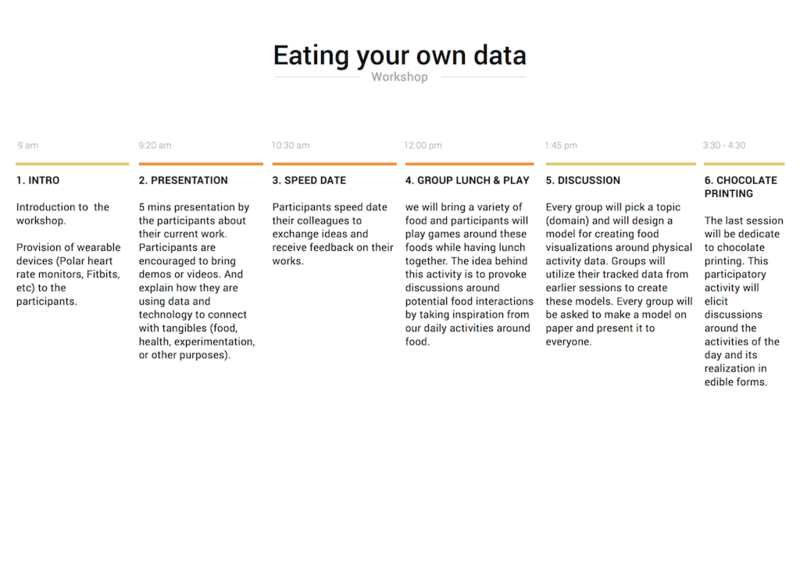 Participants will also engage in playful activities around food, which in turn will help learn and debate the opportunities that exist with edible data representation and interaction. We plan for a one-day workshop with 20 participants. The workshop is organized as follows. We invite participants to submit a four-page position paper, addressing the topic and goals of this workshop. All accepted papers will be put on the workshop website along with related works on the topic. We will promote the workshop through the website and social media. The workshop is divided into six sessions. Session 1: INTRO: We will start the first session by introducing the workshop theme, agenda for the day and will also hand over self-tracking devices such as heart rate monitors and pedometers for participants to wear for most of the workshop. Session 2: PRESENTATIONS: In the second session, participants will present their work for five minutes, where they discuss their perspectives on the crossing of food and quantified self. Participants are encouraged to bring demos and videos of their work. Session 3: SPEED DATING: Presentations will be followed with a 3 minute “speed-date”session in which all participants will talk to each other in pairs, giving them the opportunity not only to get to know each other, but also to discuss the topics raised in the presentations. We will then ask every pair to write down the three biggest challenges or issues that exists with edible data and self-tracking technology and discuss potential solutions to overcome them. After 20 minutes of discussion, we will ask every pair to present their solutions for 5 minutes. Session 4: GROUP LUNCH AND PLAY: We will have a fun activity around food. This activity will be held during lunchtime, where we will bring a variety of food and participants will play games around these foods while having lunch together. The idea behind this activity is to provoke discussions around potential food interactions by taking inspiration from our daily activities around food. We will also discuss playful themes, and behavior changing triggers and techniques that may emerge from gameplay. Session 5: DISCUSSION: Post lunch, we will divide participants in groups of 5. Every group will pick a topic (domain) and will design a model for creating food visualizations around physical activity data. Groups will utilize their tracked data from earlier sessions to create these models. Every group will be asked to make a model on paper and present it to everyone. Session 6: CHOCOLATE PRINTING: The last session of the workshop will involve chocolate printing as an example. This participatory activity will elicit discussions around the activities of the day and its realization in edible forms. Seeing the printing in situ will also help participants to gain insights on the limitations and benefits around different parameters of food printing e.g., the temperature of food material, time to print etc. All accepted submissions will be published as a technical report on the workshop’s webpage. This web page will summarize outcomes of the workshop and host a community allowing participants to further the discussion even after the workshop concludes. We aim to set up a special issue in TOCHI, for which all participants will be invited to submit. Rohit Ashok Khot is a VC Postdoctoral fellow in the Exertion Games Lab at RMIT University. Rohit investigates new playful ways of enriching our interactions and association with data. Josh Andres leads UX and design at IBM Research Australia. He investigates playful technology-mediated experiences to improve people’s quality of life. Hasan Shahid Ferdous is a PhD candidate in the Microsoft Research Centre for Social Natural User Interface at University of Melbourne, Australia. His current re- search focuses on dining experiences and the sociality and interaction among the fam- ily members in the shared family space. Jaz Hee-Jeong Choi is the Director of the Urban Informatics Research Lab and al- so the founder and acting chair of the ACM SIGCHI FoodCHI. Her research explores how various forms of digital and playful experiences are designed, developed, and integrated in different cultural contexts with a focus on self-care and mutual aid. Florian ‘Floyd’ Mueller directs the Exertion Games Lab at RMIT, Melbourne, Australia. Floyd’s research is focused on the intersection of play, technology and the active human body, aiming to support human values. Choe, E., Lee, N., Lee, B., Pratt, W. and Kientz, J. Understanding quantified selfers’ practices in collecting and exploring personal data. In Proc. CHI ’14, ACM (2014), 1143-1152. Comber, R., Choi, J., Hoonhout, J. and O’hara, K. Editorial: Designing for human-food interaction: An introduction to the special issue on ‘food and interaction design’, IJHCS, 2014, 72(2), 181-184. Sun, J., Zhou, W., Huang, D., Fuh, J. and Hong, G. 2015. An Overview of 3D Printing Technologies for Food Fabrication. Food and Bioprocess Technology (2015), 1–11.